Real time operating system developer Express Logic has been bought by Microsoft, setting up a showdown with Amazon across the Internet of Things (IoT). The ThreadX RTOS has achieved over 6.2 billion embedded and IoT deployments, especially in resource constrained environments require safety and security. This will allow Microsoft to deliver a cloud-to-node offering from Azure to ThreadX. Last year Amazon acquired FreeRTOS, the world's most downloaded RTOS to create Amazon FreeRTOS linked to the Amazon Web Service cloud in the same way. "Our goal is to make Express Logic’s ThreadX RTOS available as an option for real time processing requirements on an Azure Sphere device and also enable ThreadX-powered devices to connect to Azure IoT Edge devices when the IoT solution calls for edge computing capabilities," said Sam George, director of Azure IoT at Microsoft. "While we recommend Azure Sphere for customers’ most secured connections to the cloud, where Azure Sphere isn’t possible in highly constrained devices, we recommend Express Logic’s ThreadX RTOS over other RTOS options in the industry because of its additional certifications and out-of-the-box connectivity to Azure IoT Hub," he said. Express Logic CEO William Lamie has been developing ThreadX for the last 23 years, and the deal appears to be mutual. "Today, we are very excited to share that Express Logic has been acquired by Microsoft," said Lamie. "Effective immediately, our ThreadX RTOS and supporting software technology, as well as our talented engineering staff join Microsoft. This complements Microsoft’s existing premier security offering in the microcontroller space. As part of Microsoft, we believe our customers will be even better positioned to unlock exciting new capabilities of the IoT." The Edge AI Hardware Market is expected to see shipment of 610 million units this year and is likely to reach 1559.3 million units by 2024, at a CAGR of 20.64 percent. The report "Edge AI Hardware Market by Device (Smartphones, Cameras, Robots, Automobile, Smart Speakers, Wearables, and Smart Mirror), Processor (CPU, GPU, ASIC and Others), Power Consumption, Process, End User Industry, and Region - Global Forecast to 2024" from MarketsandMarkets sees major drivers for the market's growth are growing demand for low latency and real-time processing on edge devices and emergence of AI co-processors for edge computing. The underlying opportunities for the edge AI hardware market include growing demand for edge computing in IoT and dedicated AI processors for on-device image analytics. Major restraints for the market are limited on-device training and limited number of AI experts. Power consumption and size constraint also pose major challenges to the edge AI hardware market. In terms of device type, cameras are expected to have the highest growth as an integral part of various smart devices with Wi-Fi support, smart functions, superior speed, and enhanced performance for years. However, cameras as standalone smart devices with vision processing units (VPU) that help deliver power-efficient solutions for vision and artificial intelligence are now entering the market. Such devices are designed to run deep neural networks at high speed and low power without compromising on accuracy, which enables devices to see, understand, and respond to their environment in real time. The VPU market is constantly witnessing advancements. For instance, the previous-generation Myriad 2 VPU developed by Movidius offered deep neural network support at relatively low power. The new Myriad X VPU introduced by Intel can achieve roughly 10X better performance; with multiple neural networks running simultaneously, to offer extended autonomous capabilities across wide range of applications such as drones, robotics, VR, and smart cameras. Due to developments like these, the market is witnessing an influx of cameras powered by AI chips that allow these devices to judge moment's best suited to capture stills or videos. Dedicated AI chip or AI processors were one of the major developments in the smartphone technology last year. Increasing demand for real-time speech and voice recognition and analysis, as well as technical advancements in smartphone image recognition is driving the market for AI processors in smartphones. A majority of AI processors have an additional inbuilt Neural Processing Unit (NPU) that can handle significant amounts of parallel processing, uses low power, and is capable of cognitive tasks. With AI processors built in a phone, these AI tasks could be carried out right on the device, even without any connectivity; this would not only improve performance of the device, but also reduce strain on the battery. China is the largest market for the technology. The country is undertaking many projects, especially in the infrastructure sector, such as rail, airport, stadiums, and highway systems that are expected to require high-definition surveillance systems, which can capture clear images even in darkness. China is home to video surveillance players such as Dahua and Hikvision that dominate the video surveillance hardware market. Both companies have already launched deep learning surveillance cameras in the market and China has already started deploying cloud AI based surveillance cameras to monitor its citizens. This development will lead to adoption of edge AI in surveillance cameras. Worldwide semiconductor revenue grew 12.5 percent last year to $474.6bn according to the latest figures from market researchers Gartner. That was weaker than the previous year (21.9 percent) as memory growth slowed to 24.9 percent versus 61.8 percent in 2017. Samsung Electronics increased its lead as the No. 1 semiconductor vendor due to the booming DRAM market. Currently, 88 percent of the company’s revenue comes from memory sales. “Samsung’s lead is literally built on sand, in the form of memory silicon, and those shifting sands in 2019 will almost certainly lead to Samsung losing its No. 1 semiconductor crown to Intel in 2019,” he said. The main change was ST Microelectronics moving up from #11 to take the #8 spot. SiFive has used the RISC-V instruction set for what is says is the world's smallest embedded 64bit processor core. 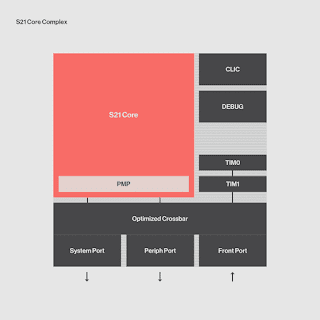 The S2 core IP series is a configurable core that can be as small as 13.500 gates in the RV32E 32bit version, but has not released the size of the S21 embedded core. This has separate Instruction and Data Buses, along with 2 banks of Tightly Integrated Memory (TIMs). Edge chips face a wide range of requirements of real-time latency, deterministic capability and stringent power constraints. The S2 enables SoCs to have an always-on low power CPU that can be combined with high-performance CPUs that switch on only when applications demand performance, such as in voice-activated smart devices. The 2 Series can be configured to be as small as just 13,500 gates (in RV32E form) and the S2 is just half the size of a similarly configured S5 core. Security is enhanced by separation between secure and non-secure domains. This degree of flexibility is what is needed to meet the constraints in terms of power, area and real-time demands as well as the requirements in terms of performance of modern edge workloads and applications. The S2 Series will be available as a customizable Core IP Series as well as in the form of standard cores via SiFive’s Core Designer. The ever-growing number of connected devices with artificial intelligence, machine learning, IoT, and real-time workloads have generated a massive demand for greatly enhanced embedded intelligence in compute at the edge. Legacy architectures have long ignored the need for small, efficient, 64-bit, real-time embedded processors says SiFive, which has secured more than 25 design wins for the 2 Series Core IP alone since its launch at DAC in June 2018. The S2 has no direct competitive equivalent, it says, providing easier integration than 32-bit physical addressing and provides the benefit of fast and efficient access to slow or far-away memories via flexible memory maps and micro instruction caches. We don't usually cover consumer equipment on the Embedded blog, but this greeting card that records and displays video caught our eye for the sheer integration and low cost potential. ViMeCa from Japanese consultancy DOKE combines a camera, 7in LCD display and battery to make it easy to create and send a personalized custom video at the push of a button without a smartphone or personal computer. "Now you can reach out and touch someone with a one-of-kind video message without a smartphone or computer," said Kenichi Hiramatsu, CEO of DOKE. "With ViMeCa, you can bring a smile to a grandparent or friend who lives far away or share your creative message with a loved one on a special day." The greeting card is 8.3 x 5.8 x 0.4 inches or A5 envelope size and weighs 8.5 ounces. It includes the built-in camera to record a message and the 7in LCD screen with memory for playback of a message of up to 4 minutes. It also has an internal battery which can be charged via a supplied USB cable, and a battery charge lasts approximately 70-80 minutes under normal usage. ViMeCa is available now on Amazon for $79.00, so it may not be that 'disposable' but shows the reducing cost of components such as the screen, encoder, decoder and memory. This is even before flexible, low cost OLED displays that wuold bring the cost down further. Based in Osaka, DOKE's businesses include customer acquisition consulting, development and sales of own branded products, and app/web/system development. VadaTech has developed an AMC card for packet filtering, intelligent networking, multimedia, video transcoding, cloud and other applications using a high performance multi-core chip from Tilera. The GX72 includes 72 identical processor cores (tiles) interconnected with Tilera’s iMesh on-chip network. Each tile consists of a full-featured, 64-bit processor core as well as L1 and L2 cache and a non-blocking Terabit/sec switch. The high processing density and high internal bandwidth of the GX72CPU make it suitable for intensive computing tasks. The 3D chip market will see a compound growth of 18% by 2023, adding $8.5bn as a result of the Internet of Things (IoT) says a report from TecnNavio. The major factor bolstering the growth of the global 3D IC market is the significant growth of the loT driving the demand for connected devices. This has significantly increased bandwidth necessities. Different vendors across the market are working collectively to address the need of connecting several products such as home appliances, smart homes, set-top boxes (STBs), and sensors with a common interacting standard. The standard would facilitate interoperability with the extensive variety of smart devices. The demand for small-sized gadgets has increased the need for more functionalities on a single device. This requires 3D IC chips with a greater number of transistors to support more functionalities. 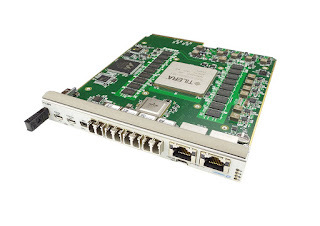 In addition, the loT requires the application of processors, multiple embedded cores, graphics processing unit (GPUs), and integrated wireless connectivity in a single package. The demand for semiconductor devices such as processors, sensors, memories and RF chips has grown significantly over the last few years. The emergence of the 3D packaging technology has enabled manufacturers to integrate more functionalities into a single chip (3D IC) at a moderate price. The increased demand for miniaturized electronic devices such as tablets has resulted in a high level of integration of components such as memory modules, sensors, and others on a single IC. Vendors need to make significant R&D investments in developing high-performance and power-efficient semiconductor ICs. Also, the complexity in manufacturing due to constant miniaturization increases the production cycle time for vendors and causes delays in product delivery. These factors can lead to additional expenses. The report identifies ASE for the packaging and Samsung Electronics, STMicroelectronics, TSMC and Toshiba for the chips as key players. Connecting vehicles is a key driver for the industry, but making it happen across different countries is a major challenge. Audi, Ericsson, Qualcomm, SWARCO and Technical University of Kaiserslautern have shown how it can be achieved at a new trilateral testbed in France, Germany and Luxembourg. The companies, which formed the Connected Vehicle to Everything of Tomorrow (ConVeX) consortium in 2016 to carry out the first announced C-V2X trial based upon the 3rd Generation Partnership Project’s (3GPP) Release 14, participated in cross-border digital testbed Project Day in Schengen, Luxembourg, at the new trilateral testbed. Audi vehicles and SWARCO’s intelligent road infrastructure are equipped with C-V2X technology using the Qualcomm 9150 C-V2X Platform. Throughout the event, the Qualcomm 9150 C-V2X Platform was used to show vehicle-to-vehicle (V2V) and vehicle-to-infrastructure (V2I) safety use cases, demonstrating the maturity and potential of C-V2X technology and the ability to operate without the need for SIM subscription (via PC5) to potentially address challenges faced with roaming and network subscriptions. These use cases include Roadworks Warnings (RWW), In-Vehicle Information (IVI) and Slow or Stationary Vehicle Warnings. SWARCO provides connected and cooperative traffic management on all established channels. In Schengen through the ConVeX project, SWARCO provides for the first time a C-V2X technology-based communication between real infrastructure components and vehicles on public roads in Europe. The key is that the C-V2X technology and products are commercially available, and make use of years of C-ITS investment and the evolution of wireless communications. The cross border demonstration follows the successful cooperation and integration of the technology among the participating companies throughout 2018 and thus far in 2019 around Europe, China, Japan, Korea, Australia, and the United States. This also heads off the challenge from 5G that comes with cross-border roaming enabled. The 9150 C-V2X Platform is commercially available and is being used in C-V2X systems rolling out this year along roadways and into vehicles, respectively. Further, Qualcomm Technologies recently announced the integration of C-V2X into the Snapdragon Automotive 4G and 5G Platforms, designed to ensure that next generation connected vehicle solutions natively support C-V2X starting from 2021 to provide both technology options. Renesas Electronics has launched two touch-free user interface (UI) microcontrollers and reference designs to simplify the design of 2D and 3D control-based applications. Based on Renesas’ capacitive sensor microcontrollers (MCUs), the microcontrollers support the development of UI that allows users to operate home appliances, as well as industrial and OA equipment without touching the devices. The UI solutions make it possible for appliance and equipment manufacturers to quickly develop touch-free interfaces that increase the added-value of their products in terms of both equipment convenience and design. There are a variety of situations where touch-free operation is advantageous, such as when the users’ hands are wet, when the controls are out of reach, or when it is not safe for the user to touch the controls. With the touch-free UI, for example in the kitchen, users could adjust water temperature and flow rate through hand gestures near the faucets or adjust stove fan operation by holding a hand over the hood. This allows designers to easily implement these interfaces in their embedded equipment. The reference designs are available for download effective immediately. The gesture controllers detect motion in a 2D coordinate system and in 3D space, respectively. With both solutions, Renesas provides design materials (circuit diagrams, board design data files, and parts lists) that form the reference hardware for the capacitive touch-key MCU, as well as coordinate calculation middleware, sample programs, application notes, and an evaluation tool for monitoring the detected coordinates. The touch-free UI solutions have passed class B (note 3) testing for the IEC 61000 4-3 level 3 and 4-6 level 3 noise immunity standards, and can achieve stable operation. In addition to the touch-free UI solutions, Renesas offers touch-key solutions for devices designed to operate with challenging or non-traditional touch materials such as woods, or required to operate in wet or dirty environments such as a kitchen or a factory floor. Renesas provides a development environment with QE for Capacitive Touch, Workbench6, solution kits and evaluation systems specialized for capacitive touch key development in addition to Renesas’ capacitive touch key MCUs starting with the RX130 Group, which are ideal for use in HMI for industrial equipment and home appliances. Qualcomm Technologies is demonstrating a number of industrial IoT applications with multiple companies at Hannover Messe using a live over-the-air 5G NR network. The demos use mobile test devices powered by the Qualcomm Snapdragon X50 5G modem and antenna modules with integrated RF transceiver, RF front-end and antenna elements. "We are excited to showcase what's possible when we add 5G to the industrial IoT," said Jeffery Torrance, vice president, business development, Qualcomm Technologies, Inc. "Qualcomm Technologies' leadership in IIoT is reflected with everything from go-to connectivity solutions like our Qualcomm 9205 LTE IoT modem, to new platforms like the recently-announced Qualcomm Robotics RB3 Platform, to joint studies with industry leaders like Bosch on key IIoT topics. With these live 5G demonstrations at Hannover Messe, Qualcomm Technologies continues to showcase the breakthrough technologies that are transforming the way the industrial world connects, computes, and communicates."